A northern outpost of the Eifel region, Düren is an industrial city between Aachen and Cologne in North Rhine-Westphalia. From the 16th century up to the 1980s Düren was Germany’s papermaking capital, and at the height of this industry in 1812 there were 17 paper mills along the banks of the Rur. To get all the facts about paper-making, head for Düren’s Papiermuseum, while the Leopold-Hoesch-Museum has galleries dedicated to art on paper. 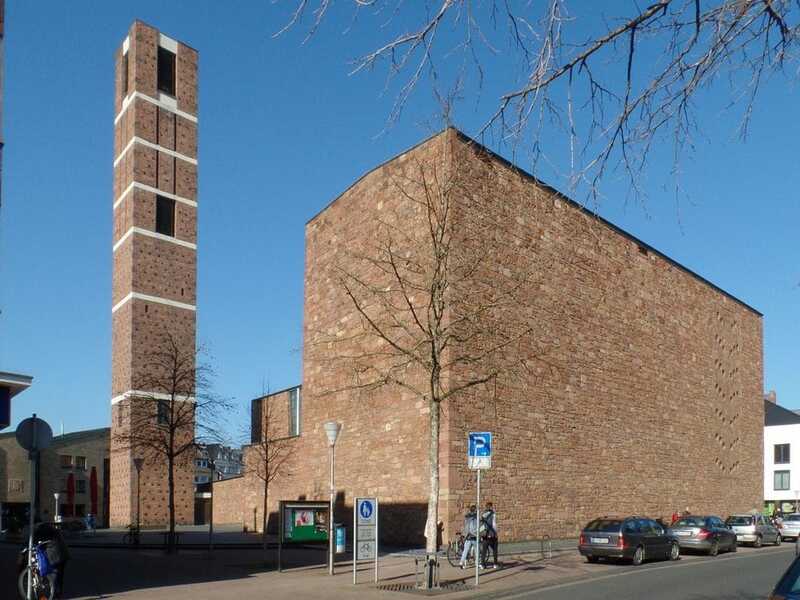 As a manufacturing city, Düren suffered in the Second World War, but monuments like Schloss Burgau were rebuilt, and salvaged fittings from the Gothic Annakirche were integrated into a modern church from the 1950s. Go upriver on the Rur and you’ll be in the Eifel region, valued for its dramatic hills, lakes and castles. 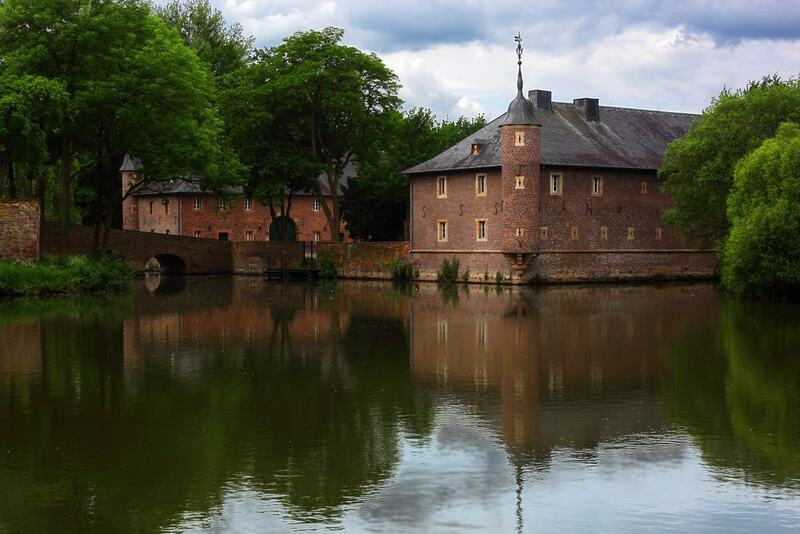 First built in 1100 or so, this moated castle to the south of Düren became a lavish palace in Renaissance times. The greatest symbol from that period is the marvellous bay window (1551) on the residence tower, which is masterfully sculpted with medallions, coats of arms and ornamentation. The castle was heavily damaged in the Second World War and this element required careful restoration in the 80s and 90s. Earlier in 1539, Hans Holbein the Younger was sent to this very building to provide a faithful portrait of Anne of Cleves for Henry VIII to decide if he wanted to marry her. 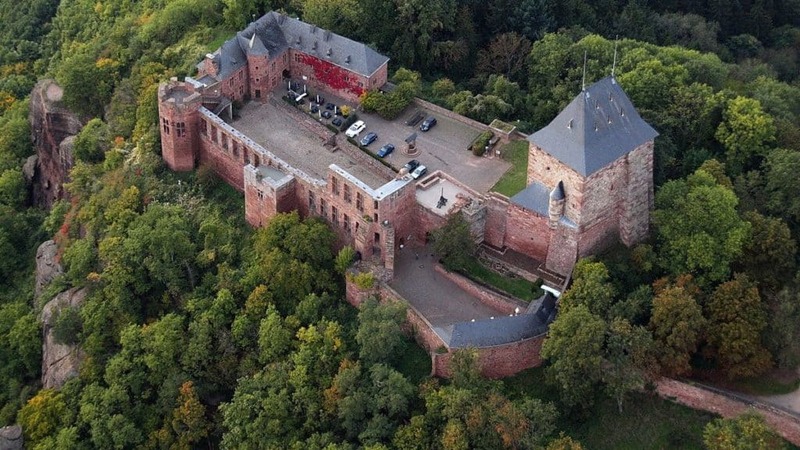 Since its restoration the castle has become an events and cultural venue for the city, with a concert hall and cafe. The city has a paper-making legacy that goes back to 1576. Those mills were set along the banks of the Rur River, the soft water of which was a key ingredient in production. And right up to the 1970s Düren was Germany’s main source of paper. In the 80s the city decided to mark its paper-making history with a museum, which opened in 1990 by the old city wall. The attraction looks at the technical side of making paper, card and cardboard, and reveals the history of the process, both locally and around the world. You can also track the evolution of the material, starting with Ancient Egyptian papyrus and moving through parchment for Medieval manuscripts. At the start of the 20th century the industrialist Wilhelm Hoesch donated 300,000 marks to the city to build a museum in his father’s memory. The magnificent Neo-Baroque edifice was ready in 1905, and it would later be one of the few monuments in Düren to come through the war unscathed. 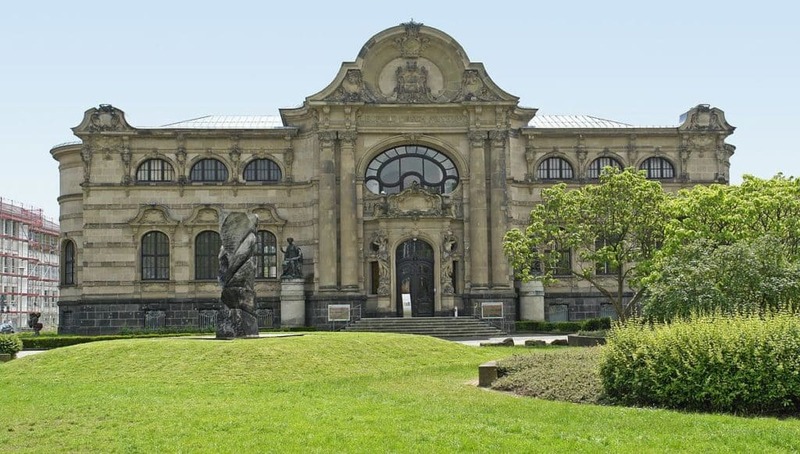 The museum is oriented towards modern and contemporary art, with a roll-call of Expressionists like Kirchner, Max Pechstein, Kandinsky, Emil Nolde and Otto Dix. Since the 80s the museum has also collected art on paper, to complement the nearby Paper Museum. And in the 2010s alone there have been exciting temporary exhibitions for works on paper by Paul Klee, the ZERO group and many more. 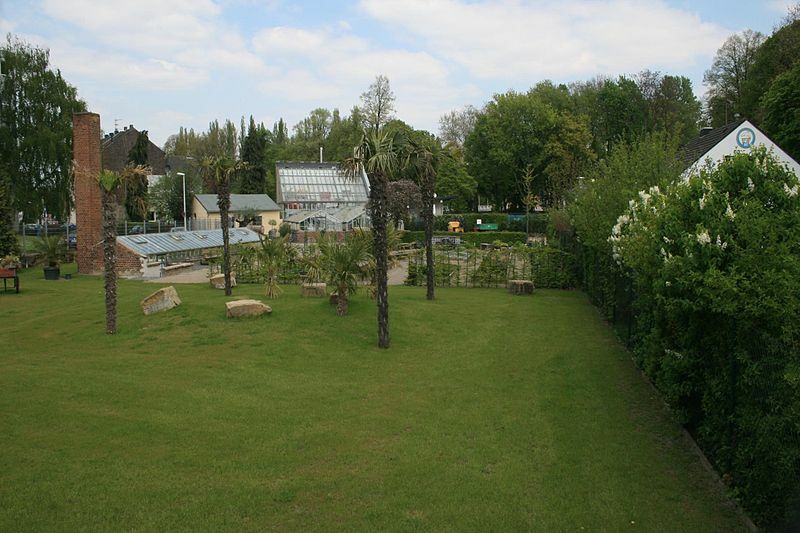 On the left bank of the Rur Düren’s city park is officially named after the former German chancellor Willy Brandt. And even though it was inaugurated in 1896, the park’s history begins after the war as the Rur River witnessed bitter fighting and almost everything along it was destroyed. Peace soon returned to this space, and outdoor concerts – a tradition before the war – have been held here once more from the 1950s. The tree-shaded path next to the Rur is very pleasant, and there’s a playground and a restaurant and beer garden at the Teuter Hof. On your walk, keep an eye out for the two giant sequoias and an ancient cedar tree. 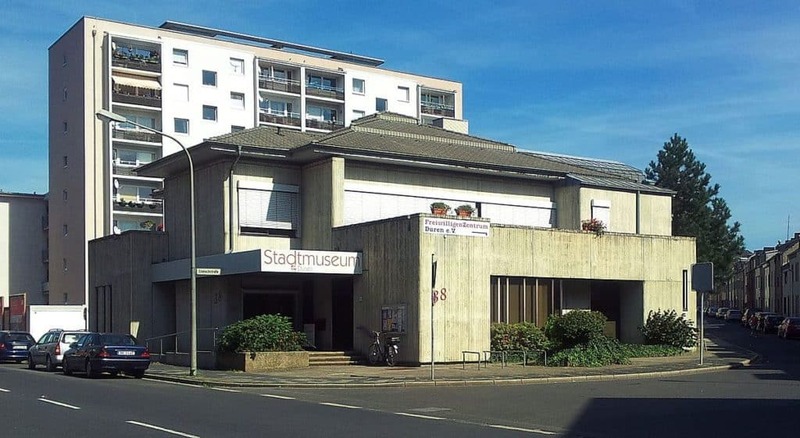 The go-to place to get your head around Düren’s story is the city museum, a volunteer-run attraction that opened in 2009. The museum has no permanent collection, and instead stages three simultaneous temporary shows. In 2017 all of these were from the 20th century. The first tackles Düren’s role in the First World War, when due to the city’s proximity to the Western Front, German soldiers were sent here to convalesce. “Betragene Hoffnungen” (Betrayed Hopes) is about the good and bad of the 1920s, revealing new fashions and home appliances of the Weimar years, but also the economic misery that came at the start and end of the decade. And finally there are accounts of the Royal Air Force’s bombing of Düren on November 16, 1944, which destroyed 90% of the city and claimed 3126 lives. The city’s 13th-century parish church was completely ruined in 1944 and the only significant piece to survive was the Gothic southern portal. So when the modern church came to be built on the site in 1954, that portal was integrated into the architecture. In the 1950s some well-known artists were called in to provide decoration: Ewald Mataré and his students designed the 13 reliefs on the outer north wall on the theme of “man’s relationship to Christ”. Within you may be surprised to find a lot of the decoration from the Gothic church that had been removed for the war to keep it safe. See the Renaissance choir stalls from 1562 and 1563. Most valuable of all is the 14th-century Annaschrein reliquary, composed of the Annahaupt, supposedly a piece of St Anne’s pate attached to a silver bust of the saint. 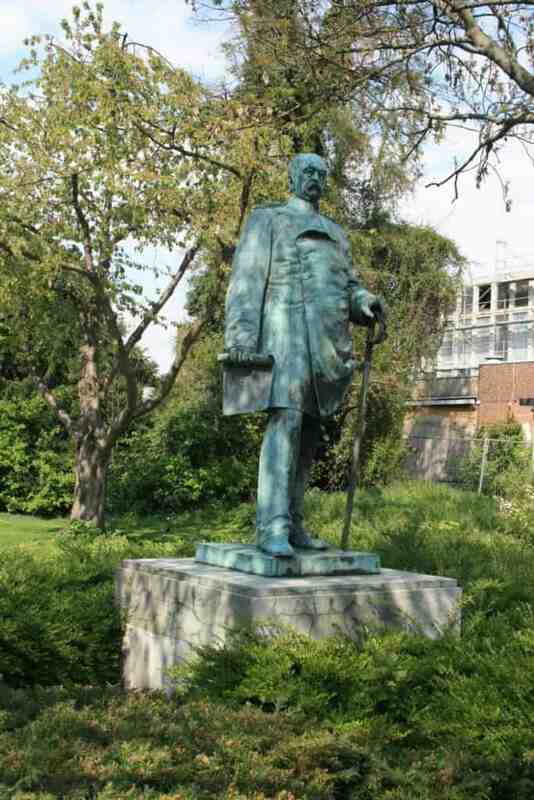 The larger than life-sized statue of Germany’s first chancellor standing next to Bismarckstraße in the Theodor-Heuss-Park is a listed monument. If you get up close you’ll see that Otto von Bismarck is carrying a document in his right hand. That represents the deed of proclamation announcing the founding of the German Empire and the Unification of Germany. The statue was cast by the prominent sculptor Joseph Uphues in 1892. It was badly damaged in the bombing in 1944 and when it was restored it was placed on a simple slab rather that the grand pedestal it had been on before. For all the destruction visited upon Düren in the Second World War the vestiges of the city wall are in surprisingly good shape. They were mostly unharmed in 1944 and now you can identify five towers and six stretches of fortifications. The walls were first erected the 1100s, and one of the reasons they’ve survived is that they were still being modified as recently as the 18th century. Those five towers are all listed monuments, and the bastion tower Pletzergassenturm has a restaurant in its lower floor and a beautiful vaulted dome above. The longest piece of the wall measures 84 metres and is up to 3.4 metres high between the two towers Grönjansturm (1500s) and Dicker Turm (1493). 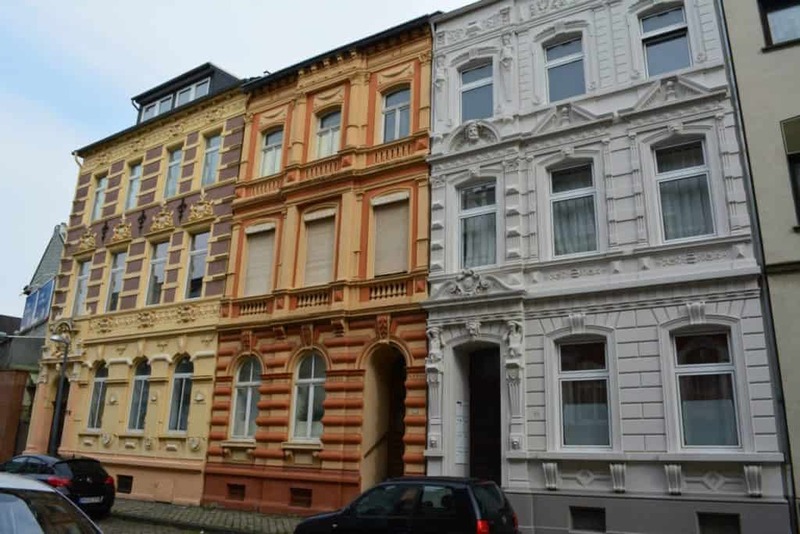 This street west of the Papiermuseum is one of the few arteries in Düren to keep a lot of its pre-war architecture. Outside the city wall, Holzstraße first appeared on the city map in 1634 lumber road that went down to the side of the Rur. When Düren grew outside its walls in the 19th century the street was flanked by stately Historicist mansions and apartment blocks for the city’s burgeoning middle class. You can appreciate beautiful listed buildings at 15, 17, 19, 31, 25, and 68. On the grounds of the Medieval castle Burg Bubenheim there’s a children’s play park popular with families from all over the region. One of the neat things about Bubenheimer Spieleland is that it’s an all-weather option, with things to do both indoors and outdoors. In mid-July each year the 40,000-square-metre is ready for action, and it comes with an outdoor climbing park, with slides and lots of fun and challenging obstacles. There’s also a big splash ride and carpet slide, along with go-karting, trampolines and a water playground. If the weather doesn’t cooperate you can head into the large hall for a labyrinth, pedal karts, bowling and more. On a lofty ridge at the very tip of the Eifel National Park is a Medieval hilltop castle founded in 1177. When it was constructed, Burg Nideggen was a buttress for the Counts of Jülich against the Archbishop of Cologne to the east. The Counts and Dukes of Jülich would reside here until the line died out, after which the castle was ruined in 1542 in a war of succession. It was only in the 1950s that restoration could begin, and today you can see the 14th-century outer gate, the earlier Romanesque inner gate, the spectacular 14th-century Palas hall and the keep from the late 12th century. 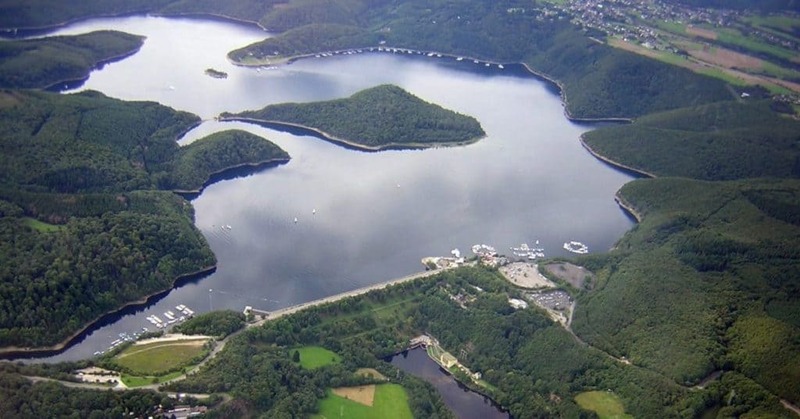 The 77-metre-high Rur Dam was completed in 1939 and created the Rursee, a reservoir almost eight kilometres in size in a cauldron of high wooded hills. The scenery in the Eifel National Park is best enjoyed on a boat, and the Weisse Flotte cruise company organises trips from its docks on the eastern shore. From May to September there are at least four departures a day, and each boat has an upper open deck and a restaurant. Leaving the jetty at Schwammenauel it will take 45 minutes to arrive at the picturesque village of Rurberg, and you could disembark on the way at Eschauel where there’s a natural beach. At Rurberg you could catch a return boat or continue your voyage by catching another boat for trip on the connecting Obersee. Düren could be your springboard for a bike trip beside the Rur. There’s a 180-kilometre trail along the course of the river, beginning at the highest point in Belgium at Botrage and ending in Roermond in the Netherlands where the Rur enters the Meuse River. What makes it so special is the variation in landscapes and quantity of sights on the route, from Medieval castles and cathedrals to mining headframes. If you’re up for challenging climbs and river canyons the trail to the south and southeast of Düren will be to your taste. 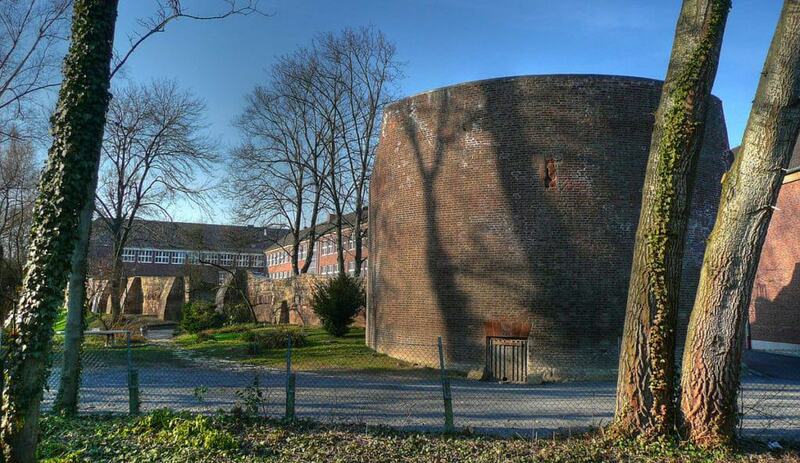 After the river passes through Düren, the landscape becomes smoother, so families could spend a while coasting on the trail to the norht, stopping at the Brückenkopf-Park Jülich where there’s a Napoleonic era fortress. 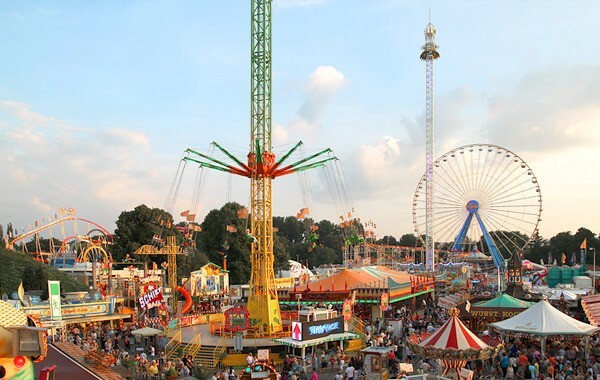 Almost a million people come to Düren during a nine-day party kicking off on the last Saturday of July. Annakirmes is one of the largest folk festivals, not just in North Rhine-Westphalia, but nationwide. Each year there’s a huge fair, a cavernous marquee where all main events take place, and over 150 stalls for food and amusements. A few quirky traditions have cropped up down the years: One takes place on the first Saturday when there’s a cherry stone spitting contest, in which contestants from all over Germany and from as far as Switzerland compete to spit their stone the furthest. The Tuesday after is the best time to come with your family as all the rides and amusements are half price, while on the Friday there’s a fireworks display. 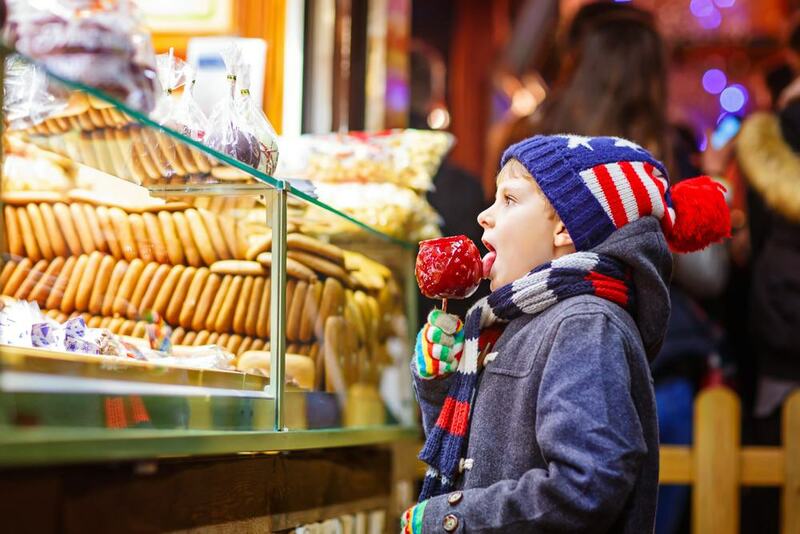 Düren is aglow with seasonal cheer all through the advent period when there’s a joyful Christmas market by the town hall from the last week of November to December 30. A fairytale village pops up on the square and this is lit from above by strings of fair lights. These add up to 847 metres and have almost 4,000 bulbs. In the market you can buy all sorts of handmade goods like knitwear, wooden toys, tree decorations, candles jewellery and leather items. And it wouldn’t be a German Christmas market without goodies like roasted almonds, Lebkuchen (gingerbread) and Glühwein (mulled wine). For youngsters there’s a 100-year-old carousel, and if you come by on weekends there’s a programme of music and family entertainment.